Kanyika Niobium Project in Mzimba and Chiziro Graphite Project in northeast of Lilongwe are progressing according to Globe Metals & Mining‘s recent announcements. These projects are two of the four projects being run by the Australian-listed, African-focused specialty metals and rare earths company. In March 2014, Globe announced that its 40-tonne bulk sample from the Kanyika Niobium Project arrived in China for the metallurgical pilot plant programme. Globe’s announced today (26 June 2014) that Kanyika metallurgical pilot plant has now commenced operations at Guangzhou Research Institute of Non-Ferrous Metals (GZRINM). Circuit optimisation is currently underway. This is expected to be complete by the third quarter of 2014. The first of four pilot-plant runs is now in progress, using a feed blend of surface and transition material. This blend represents the mill feed in the initial years of plant operation. As part of process optimisation, minor changes to the processing circuit are being made to increase recovery and grade of the concentrate, as well as reduce reagent consumption. Once the circuit has been optimised for this blend, subsequent pilot runs will focus on testing alternate mineral blends and further optimising the reagent scheme for these blends. The mineral concentrate produced from this pilot plant exercise will be used for further downstream metallurgical testing and production of marketing samples. Preliminary samples have been collected and mineralogical work is currently underway at a metallurgical laboratory in Perth to support optimisation efforts. Progress and interim results of the pilot plant will be reported when available. 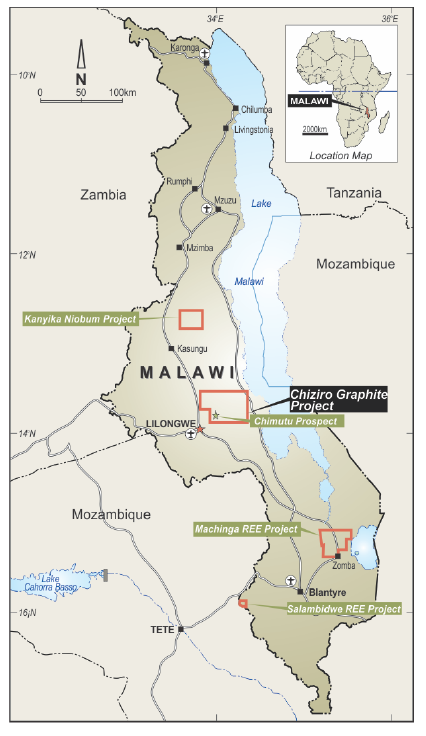 Yesterday (25 June 2014), Globe released an announcement about its Chiziro Graphite Project. The company acquired the Exclusive Prospecting Licence for this project in 2012. To date, Globe has completed a mapping and rock chip sampling programme at the Chimutu Prospect within the project. Rock chip samples were collected during an exploration programme in March and April 2014. Assays on the 40 rock chip samples have now been completed. Globe is encouraged by the results: 22 of the 40 samples assayed greater than 10% Total Graphitic Carbon (TGC) with one sample assaying a high of 52.5% TGC. Globe has carried out geological mapping along with this initial encouraging rock chip sampling. Subsequently, a broad spaced trenching programme has been planned for the Chimutu area, within the Chiziro Graphite Project to test the indicated strike length of graphite mineralisation. Trenching is planned for an estimated 5,600 metres for the Main and Musinda Trends to define the nature of graphite mineralisation over a 4 kilometre extent. Globe has not yet moved from prospecting to mining at any of its project sites in Malawi. The company continues to negotiate the terms of the Mining Development Agreement with the Government of Malawi for the Kanyika Niobium Project. The International Senior Lawyers Project (ISLP) has provided pro bono lawyers to the Government for these negotiations. ISLP sent Mark Goodrich, a partner at White & Case LLP, to Malawi in May 2014 to support these negotiations. Negotiations are ongoing. In #Malawi to continue work assisting Government with negotiation of natural resources contracts as part of @whitecase pro bono. Just completed another ISLP/@WhiteCase pro bono mission in #Malawi, helping Government on natural resources contracts.